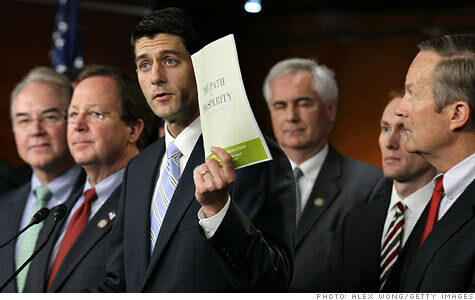 NEW YORK (CNNMoney) -- Paul Ryan is a budget cutting machine. His ambitious new proposal tackles Medicaid, Medicare, long-term debt and short-term spending. Most of the eye-popping $6 trillion in savings over the next decade come from getting a handle on those long-term issues. But there would also be upfront pain for Americans. Ryan's plan would slash a small part of the budget -- non-security discretionary spending -- to pre-2008 levels. Specifically, the House Budget Committee chairman would cut $79 billion in "non-security" funds in 2012 and more than $1 trillion over 10 years. High-speed rail funding would get the axe, farm subsidies would be reduced and the Environmental Protection Agency budget would take a hit. Those are just a few examples. The sheer size of the cuts means a virtual wrecking ball of spending reductions will cut across many government agencies. That much we know. Which programs are on the chopping block? That's far less clear. And really, that's not the point. Budget resolutions like the one Ryan unveiled Tuesday set top-line spending numbers, and it will be the work of the House Appropriations Committee to fill in the details. "Budget resolutions are typically political documents, rather than policy-making proposals," said Craig Jennings, the director of federal fiscal policy at OMB Watch, a group that monitors federal spending. Ryan's plan doesn't call for an across-the-board cut to all agency budgets. Instead he offers some hints about what programs he, and other Republicans, would like to cut. Ryan employs a shotgun approach, picking and choosing budget cut ideas from the slew of proposals that have been floated in recent months. First up: H.R. 1. Ryan says his budget builds on the cuts passed by the House earlier this year. He calls it "the largest spending reduction in non-defense discretionary spending in the history of the republic." That bill failed in the Senate, and the overtly political nature of some of the $60 billion in cuts from current levels meant President Obama would never consider signing it. Ryan also borrows ideas from Obama's fiscal commission, such as reducing the federal auto fleet by 20% and selling excess federal real estate and other property. The budget also takes a page from a Government Accountability Office report released earlier this year that identified waste and inefficiencies in the government. Ryan doesn't say how much money he thinks can be cut in this area, but he specifically calls out the Highway Trust Fund as a source of savings. Also on the table are some of the ideas that have resulted from YouCut, a program used by Republicans to solicit Internet votes on what programs they should cut. Again, it's unclear how much Ryan thinks he can save, but he does mention the Government Printing Office as a target. One area where Ryan does get specific is the federal workforce. Lamenting growth in the number of government jobs, Ryan calls for a 10% reduction in federal employees through attrition. That means the government would hire fewer workers to replace retirees leaving their jobs. In addition, he would freeze salaries and reform their benefits packages. In total, changes to the federal workforce would save taxpayers around $375 billion over ten years. In another nod to political goals, Ryan proposes a rollback of the Wall Street and health care reform laws. Presumably, the agencies tasked with implementing the legislation would be targeted for budget cuts. For Ryan, his sweep of the non-security discretionary budget is long overdue. "With this budget, Congress finally incorporates many common-sense proposals for reducing waste that went unheralded for too long," the report says. But really, just like Obama's budget proposal, this one is dead-on-arrival, even before the Appropriations Committee starts to fill in the gaps. After all, Democrats still control the Senate and White House. "A lot of congressman, and the president, make political statements with these documents rather than figuring out the needs of the country and how to best address them," Jennings said.